Thomas Brodie-Sangster (born May 16, 1990) also credited as Thomas Sangster, is an English actor, best known for playing Sam in Love Actually (2003), Simon in Nanny McPhee (2005), Romulus Augustulus in The Last Legion (2007), Ferb in Phineas and Ferb (2007–2015), Jojen Reed in Game of Thrones (2013–2014) and Newt in the Maze Runner film series (2014–2018). Sangster also grew in popularity for starring in critically acclaimed cult films such as Death of a Superhero (2011), Bright Star (2009) and as Paul McCartney in Nowhere Boy (2009). He also had a cameo appearance in Star Wars: The Force Awakens (2015) and a role as Whitey Winn in the Netflix miniseries Godless (2017) and John Tracy in Thunderbirds Are Go (2015–present). 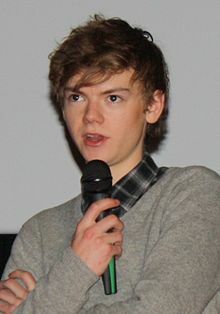 Thomas Sangster was born in Southwark, a district in London, England on May 16, 1990 to Mark Sangster and Tasha Bertram. Sangster's father's family is from Banchory, Scotland. His great-grandfather, Anthony Bertram, was a novelist, and a maternal ancestor was politician and colonial administrator Sir Evan Nepean, through whom he has Cornish and Welsh ancestry. He has one sister, Ava Sangster. Sangster plays bass and guitar, and he learned to play left-handed guitar to portray the left-handed Paul McCartney in the feature film Nowhere Boy. He also learned how to play the drums in the feature film Love Actually (2003). In 2001, Sangster's first acting role was in a BBC television film, Station Jim. He subsequently appeared in a few more television films, including the lead roles in Bobbie's Girl, The Miracle of the Cards (based on the story of Craig Shergold) and Stig of the Dump. He won the "Golden Nymph" award at the 43rd Annual Monte Carlo Television Festival for his role in the miniseries Entrusted. Sangster's first major theatrical film was Love Actually (2003), in which he played Liam Neeson's stepson, Sam. He was nominated for a "Golden Satellite Award" and a "Young Artist Award" for his role in the film. Sangster next appeared in a television adaptation of the novel Feather Boy and played a younger version of James Franco's role in the film version of Tristan & Isolde. Among other things, Sangster takes part in a (child's) sword fight in the film. Sangster next starred in the commercially successful film Nanny McPhee (2005), as the eldest of seven children. In March 2008 it was announced that Sangster would star in Steven Spielberg's CGI motion capture film The Adventures of Tintin as the title character of Hergé's comic books. Sangster left the project after scheduling difficulties when filming was delayed in October 2008 and the role was given to Jamie Bell. At the end of March 2008, he began working with director Jane Campion on her film Bright Star, a love story with Ben Whishaw and Abbie Cornish portraying John Keats and his lover Fanny Brawne. Aaron Johnson, Kristin Scott Thomas and Anne-Marie Duff in Nowhere Boy, a film directed by award-winning artist Sam Taylor-Wood, about the teenage years of John Lennon and the two women who shaped his early life: his mother Julia (Duff) and his aunt Mimi (Scott Thomas). This would be his second time acting with Johnson, the first being in 2004's Feather Boy. Sangster appeared in the film Some Dogs Bite about a boy who wants to keep his family together. Casey (Sangster) takes his baby brother out of care, and with the help of his older brother, goes in search of their father. Sangster appeared with Andy Serkis in an Irish film, Death of a Superhero, based on the novel, Death of Superhero by Anthony McCarten. Additionally, Sangster plays Liam in the 2011 film, The Last Furlong. In April 2011, he made a guest appearance as Adam Douglas in an episode of British detective drama Lewis. In 2012 he starred in The Baytown Outlaws and in Ella Jones's short film, The Ugly Duckling, the third installment of the Tales trilogy of reworked fairy tales from More Films. He also plays the role of Jojen Reed in the HBO series Game of Thrones. In 2015, he provided the voice of John Tracy in ITV's remake of Gerry Anderson's puppet series Thunderbirds Are Go (2015-2018). 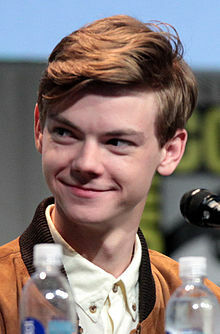 Sangster played Newt in the 20th Century Fox films The Maze Runner (2014) and Maze Runner: The Scorch Trials (2015), as well as Maze Runner: The Death Cure (2018). In BBC2's 6-part television adaptation of Wolf Hall (on BBC2 from 21 January 2015), Sangster portrays Rafe Sadler, the ward of Thomas Cromwell. On 24 May 2017 a 15 minute sequel to Love Actually was released with Sangster as part of the cast. It was shown on the BBC as part of Comic Relief's Red Nose Day and titled Red Nose Day Actually and brought back a large number of scenes from the first film. Sangster portrays the role of Whitey Winn in the Netflix western drama miniseries, Godless (2017). Sangster established Brodie Films in 2006 with his mother, Tasha Bertram, "to create opportunities in the film industry for new British talent; innovative writers, actors and directors." The company was dissolved in May 2013. Sangster plays bass guitar, and in January 2010 joined the band Winnet, in which his mother sings the vocals. Ultimate Force Gabriel Episode: "What in the Name of God"
2005 Julian Fellowes Investigates: A Most Mysterious Murder John Duff Episode: "The Case of the Croydon Poisonings"
2007 Doctor Who Timothy "Tim" Latimer Episodes: "Human Nature" and "The Family of Blood"
2011 Lewis Adam Douglas Episode: "The Mind Has Mountains"
2012 Accused Jake Murray Episodes: "Tina's Story" and "Mo and Sue's Story"
2014 American Dad! N/A Voice role; episode: "I Ain't No Holodeck Boy"
^ a b "Winnet has recently been joined by Thomas Sangster on Bass and Leo Ferdorcio on Drums". Winnet-music.com. 19 May 2010. Archived from the original on 4 January 2012. Retrieved 24 January 2012. ^ Death of Ernest Sangster, BEM winner, aged 83, deesidepiper.co.uk; accessed 3 October 2015. ^ Sparrow, Elizabeth (n.d.). "Nepean, Sir Evan", Oxford Dictionary of National Biography Online, (subscription only), accessed 14 March 2014. ^ a b biosstars.com. "Biosstars Database – The 43rd Annual Monte Carlo Television Festival". Biosstars.com. Archived from the original on 20 February 2012. Retrieved 24 January 2012. ^ "Annual Young Artist Awards for Hollywood's Teen & Child Stars". Youngartistawards.org. Retrieved 24 January 2012. ^ "Series Three Update". Outpost Gallifrey. 29 December 2006. Retrieved 30 December 2006. ^ Brown, Mark (28 March 2008). "Blistering barnacles! It's Spielberg's new Tintin". The Guardian. London, UK. Retrieved 23 May 2009. ^ Anne Thompson (31 October 2008). "Sony/Paramount financing "Tintin"". Variety. Retrieved 1 November 2008. ^ Singh, Anita (27 January 2009). "Tintin: Daniel Craig and Jamie Bell to star in new Steven Spielberg film". The Daily Telegraph. London. Retrieved 23 May 2009. ^ Independent Woman (22 October 2010). "Hobbit of a lifetime: Serkis act returns". The Irish Independent. Retrieved 24 January 2012. ^ "Tales – About". Archived from the original on 14 January 2016. Retrieved 12 March 2013. ^ Ryan, Maureen (13 July 2012). "'Game of Thrones' Season 3 Casting News: 'Office,' 'Avengers' Actors Join The HBO Series". Huffington Post. Retrieved 15 July 2012. ^ Alice Vincent, "Wolf Hall cast to include Damian Lewis and Mark Rylance", Daily Telegraph, 2 May 2014; accessed 30 December 2014. ^ Stern, Marlow (23 May 2017). "'Love Actually 2': Inside the Star-Studded Sequel". The Daily Beast. Retrieved 25 April 2018. ^ "Brodie Films". Brodie Films. 18 July 2009. ^ "Company Check: Brodie Films Limited". Archived from the original on 26 August 2014. Retrieved 19 May 2014. ^ "News | Thunderbirds Are Go". Thunderbirds.com. 22 August 2016. Retrieved 21 December 2016. ^ 'Game of Thrones' Actor Thomas Sangster to Appear in Brit Rock Music Video. Hollywood Reporter (24 February 2014). Retrieved on 30 October 2015. ^ "Radio Listings – Country Life". Radiolistings.co.uk. 16 December 2011. Retrieved 24 January 2012. ^ "Big Finish Productions – The Mind's Eye". Bigfinish.com. 27 July 2007. Retrieved 24 January 2012. ^ "Big Finish Productions – The Bride of Peladon". Bigfinish.com. 27 July 2007. Retrieved 24 January 2012. Wikimedia Commons has media related to Thomas Brodie-Sangster.